We highly recommend two Airplane Flight Tracker tools which we have used several times. When our daughter flew to Canada and the United States we were able to keep an eye on each and every airplane she flew on. Both tools are very easy to use and only require the airplane flight number you are needing to track. As previously mentioned the flight tracker tools are very easy to use. Here is a quick demonstration. Let's start with the airplane tracking tool located by clicking here. On the left hand side of this new page you will see an area with the heading "Flight Tracker". Just underneath this is an area where you enter the name of the airline you are needing to track and under that again the particular flight number. That's all there is to it. So to track an American Airlines, United Airlines, British Airways, Qantas flight or practically any other airplane flight that is all you need to do. The next airplane tracking tool is just as easy to use. However you are going to need to download this amazing tool onto your desktop. No need to worry, remember we have tested and used both of these tools and highly recommend them. This is our preferred airplane flight tracker tool from fboweb. Click here and you will quickly see why. Wow what detail. Remember with the first tracking tool you needed to enter the airplane Airline company name and flight number? The same applies here where you see the heading "Track a Specific Flight". Look at the detail. How impressive is that! Now you have all that you need to track any airplane flight in the future. 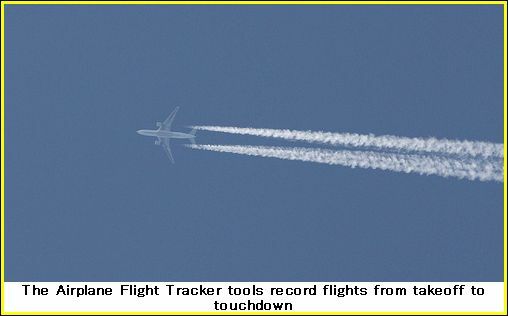 All you need do is add this page to your Bookmarks, label it Airplane Tracking and it will be available at all times. Needing some extra assistance with your Airplane Flight Tracker tool? Contact Us by clicking here.